Students and faculty at the UNL now have access to a connected, collaborative hub at the center of campus. A new connected learning center at the University of Nebraska-Lincoln gives students a 24-hour space to study and record video, offering a vision of what collaboration looks like in the 21st century. 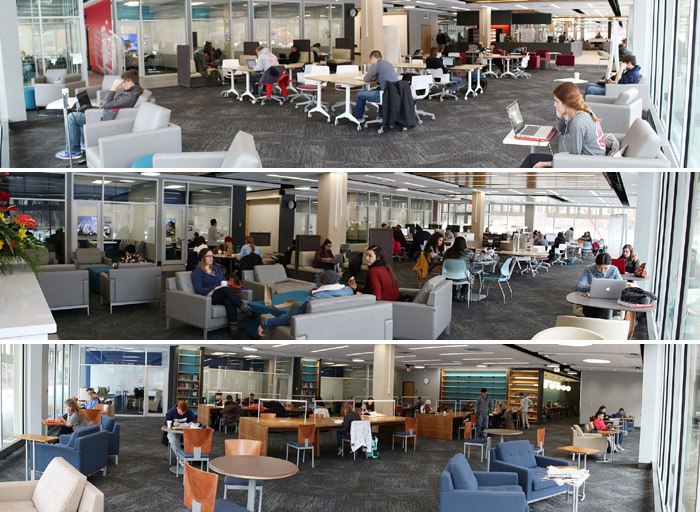 The Adele Coryell Hall Learning Commons opened this month at the university's Love Library North. The $10 million project created a new, technology-rich space for students and faculty. Students now have access to private and group study rooms, a one-button studio allowing them to record presentations and direct access to campus tech support. Moveable furniture, device charging stations and new wireless connections allow students to design their own study environments. "The Adele Hall Learning Commons will be the core of the student's academic experience," Chancellor Harvey Perlman said in a news release. "It returns Love Library to its central place in the academic environment of a modern 21st-century university." Work is underway on a digital learning center set to open in the fall that will include a lab equipped with nearly 200 computers. The opening of the Adele Hall Learning Commons is just one facet of the work being done at the University of Nebraska-Lincoln to bring the campus into the 21st century. Last year, the university's Memorial Stadium underwent a dramatic overhaul that expanded Wi-Fi capabilities and installed Cisco StadiumVision, which sends high-definition video and digital content around the stadium. To top it off, the university’s team created a smartphone app that gives fans access to streaming video of games.